If you bake one pie this Thanksgiving Day, make it Dorie's Greenspan's Thanksgiving Twofer Pie. Two of Thanksgiving's most cherished pies, pumpkin and pecan, are gloriously united to create a unique spiced-laced, sticky-sweet, nutty, pumpkin-y pie. Don't you just love a twofer? This recipe is from Dorie Greenspan's cookbook Baking: From My Home to Yours. You can serve this pie warm or at room temperature, though I prefer it chilled. And don't forget the freshly whipped cream. 1 Good For Almost Everything Pie Dough: See Dorie’s recipe here. 1. Center a rack in the oven and preheat to 450 degrees F. Put the pie plate on a baking sheet lined with parchment paper. 2. To make the pumpkin filling: Put all the ingredients in a food processor and pulse and process, scrapping down the sides of the bowl as needed, for 2 minutes. Leave the tilling the processor for the moment. 3. To make the pecan filling: in a medium bowl, with a whisk, beat all of the ingredients except the pecans together until smooth. 4. To assemble: Give the pumpkin filling one last quick pulse, then remove the bowl from the machine, rap it on the counter to de-bubble the batter and put the filling into the piecrust. Top the pumpkin filling evenly with the nuts, then pour over the pecan filling mixture. Use your finger to poke down any pecans that float to the top and aren't covered with filling. 5. Bake the pie for 10 minutes. Reduce oven temperature to 300 degrees F and bake for another 35-40 minutes, or until it is evenly puffed and a thin knife inserted into the center comes out clean. Transfer the pie to a cooling rack and let it stand until it is just warm or until it reaches room temperature. It looks to die for! I really have to try that pie since I'm a pecan and pumpkin pie addict. Two favourites in one, in fact I would probably enjoy this more than if I had them separately Susan. Since I always find myself unable to choose which slice of pie I want at thanksgiving this is perfect because it means I don't have to! Praise the heavens. Oh...My...God...This looks out of this world. I am definitely adding this pie to my Thanksgiving menu. Thanks!!!! This is brilliant, as is everything from Dorie! I might actually reconsider and offer to bring dessert this year based on your photo, Susan! Love both the pecans and the pumpkins; looks so so delicious! Wow. Is there much more to say? This looks divine. The recipes from your blog are making quite the contribution to my T-giving table. 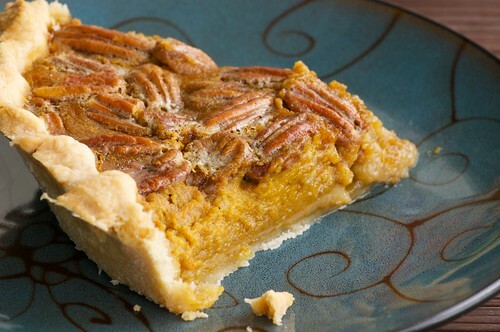 I adore LOVE fantasize and generally LUST after Pecan Pie. Pumpkin ..... not so much. It's like the geeky neighbor kid who you have to dance with because your mother tells you to be nice, but really you're just counting the minutes till you can make a reasonable break for it and go talk to the hottie across the room. That's what Pumpkin vs Pecan Pie is like in my head. Only this pie might turn things around. Like the geeky kid got taller, lost the bottle thick glasses and baby fat, and suddenly started to look.... well... Realy Good. This might be the beginning of something wonderful and unexpected. Hmm...... I do see my contribution to the Thanksgiving dessert table here. Susan, I dont ever veer from tradition when it comes to the Thanksgiving Day meal....but this pie just pushed me over the edge....its on the menu! And my mouth is watering as I type...can't wait! Thanks for sharing. Dorie Greenspan is brilliant. Her recipes work and the food is delicious. Saw this on your blog, pulled out my cookbook and made it for Thanksgiving. It was perfect. Thanks for the suggestion.